Daffodils in full bloom in January. Photo by Ecoyards. It’s always a welcome relief to see early signs of spring around Seattle. 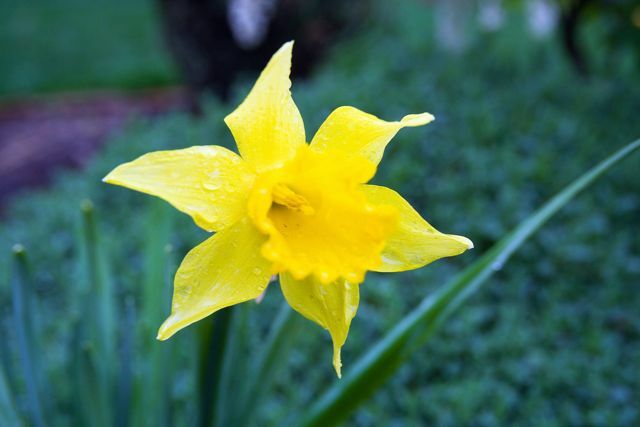 Our Ecoyards maintenance crews spotted daffodils in full bloom recently, and they’re also reporting that weeds are popping up with a vengeance in landscape beds and lawns. 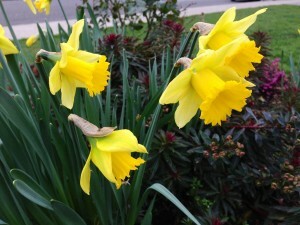 Are we seeing signs of an early spring in Seattle and elsewhere? The weather-predicting groundhog Punxsutawney Phil says yes. The Pennsylvania groundhog didn’t see his shadow last week when he popped out of his burrow, so his handlers say spring is on its way. You can dismiss the groundhog as folklore, but a couple of recent studies have shown that we’re experiencing warmer springs and that’s causing flowers to bloom and trees to leaf earlier than they have in past years. What do you think? In another study published in Geophysical Research Letters, Princeton scientists found that trees in the continental United States could send out spring leaves many days earlier in the future than they did. According to this UPI article, by the year 2100 some trees could be putting out spring leaves from 8 to 40 days earlier depending on the part of the country, compared to the late 20th century. Are flowers blooming earlier than usual in your yard? 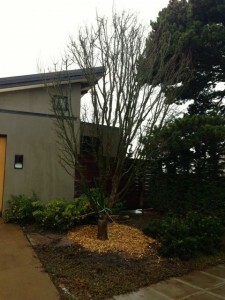 Here was the dilemma: one of our clients had a gorgeous Lions Head Japanese maple that had grown too big for its location. It was already 7 feet tall when the homeowner planted it on his property 12 years ago, so you can imagine how much it had grown since. 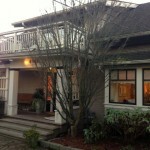 Our client was looking to move the maple because it was planted too close to the house; its roots were likely to get tangled in underground gas lines and the top branches would soon interfere with overhead cable lines. He also had a personal attachment to the tree, so wanted to find a way to preserve it if possible. And what’s not to love about it: this deciduous tree has beautiful green foliage that turns red in spring and a spectacular gold in the fall. It can grow to about 20 feet tall at maturity with a spread of about 15 feet. 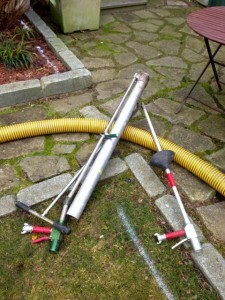 The problem: the roots of the Lions Head Japanese Maple were so close to gas lines that we couldn’t dig it out without striking those lines and causing all kinds of mayhem. The solution: we hired an arborist who used “an air knife” to safely excavate soil from the maple’s tree roots without having to hack away with a pick or shovel and otherwise damaging the roots. Opening up root-ball with air knife. The air knife uses compressed air (not unlike air tire pumps you find at gas stations) at about 185 psi rating. The pressure from the air knife removes soil away by focusing a stream of air around the roots. Apparently, this technology has been used by the military to excavate land mines. 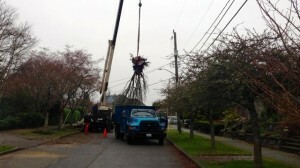 Crane places tree in truck for move. 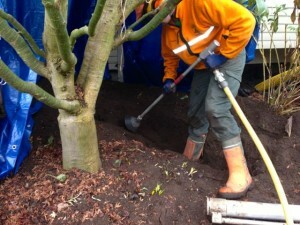 The process of air-excavating the tree from its original location was tedious. It took hours to gently remove the soil away from the root ball. Once we had freed the soil from the root ball, we brought in a crane to raise the plant and moved it into a truck where we then transplanted it into its new location. 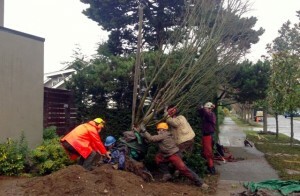 Crew places Lions Head Japanese Maple in its new location. Happy tree in its new location. 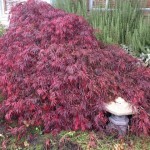 This maple, Acer palmatum “Shishigashira”, loves full sun to partial shade, and is relatively low maintenance. It can live to be about 80 years old! “The battle has been raging for months, and the city’s latest proposal is to allow no more than 25 percent of a homeowner’s front yard to be planted in fruits and vegetables,” Bittman writes. Fortunately, the city of Seattle has been encouraging residents to plant urban gardens for a number of years as the urban farm movement has taken hold. The mayor and others even recently expanded the number of P-patches in the community where residents can garden if they don’t have their own plots. Still, it wasn’t long ago when homeowners were chastised for not obtaining a $225 street use permit to plant vegetables or flowers in the city-owned property known as parking trips (located between the sidewalk in front of your home and the street). We wrote about the city revising the rules in 2009 after much citizen uproar. The new guidelines are here, and homeowners are free to plant fruits and vegetables in that city-owned parking strip, with some exceptions; for example, the city says don’t plant fruiting cherry, apple or pear trees that may drop fruit and can pose a safety risk to oblivious pedestrians. 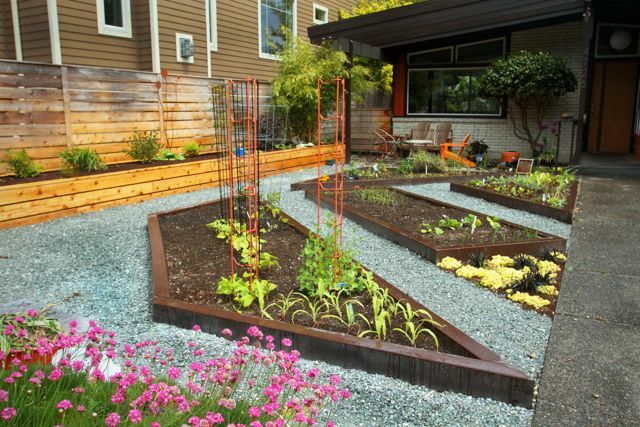 Not every homeowner will want to tear up their front lawns _ or even devote the time to keep an urban vegetable plot. Let’s face it, vegetable plots can be very time consuming, and not too pleasing to look at during the winter months (the city suggests planting a winter cover crop to keep soil from running off the property and into the storm drains). We think there are certainly benefits to having lawns (think young kids and pets), as long as they’re maintained and grown responsibly. Read more about how we maintain lawns in a ecologically responsible way, including leaving grass clippings on the lawn, using organic fertilizers sparingly, avoiding pesticides (weed and feed products), planting grass seeds that thrive in the Northwest, and going easy on the watering hose. We’d like to hear from those who are tending vegetable gardens in parking strips. What are you growing in winter months? What are you planning to grow this season? Are there vegetables or fruits that work better than others? Photo by JKehoe_Photos via Creative Commons License. What popular Christmas plant goes by the name Cuitlaxochitl, Flower of the Holy Night, or Crown of the Andes, and has even been referred to as lobster flower or flame-leaf flower? If you guessed pointsietta, you’re right. In the U.S., poinsettias got their name from a botanist and the first U.S. ambassador to Mexico, Joel Roberts Poinsett, who introduced the plant into the country in 1828. But its history goes back many centuries, according to this terrific reference guide from the University of Illinois Extension. The Aztects called these bright red plants Cuitlaxochitl. They used the sap to control fevers and the leaves to make a reddish dye during the 14th through 16th century. Poinsettias are part of the Euphorbiaceae or Spurge family. Botanically, the plant is known as Euphorbia pulcherrima. The U of Illinois experts also dispense with a myth, noting that pointsettias are NOT poisonous. It notes that an Ohio State University study showed that a 50-pound child would have to eat more than a pound-and-a-quarter of Poinsettia leaves (500 to 600 leaves) to have any side effects. 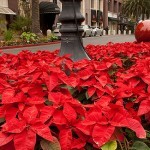 The most common side effects that have been reported from Poinsettia ingestions are upset stomach and vomiting. The leaves are reportedly not very tasty, so it’s highly unlikely that kids or even pets would be able to eat that many! _ Make sure it is wrapped properly because exposure to low temperatures even for a few minutes can damage the bracts and leaves. _ Keep in indirect light. Six hours of light daily is ideal. Keep the plant from touching cold windows. _ Keep them away from radiators, air registers or open doors and windows. _ Punch a few holes in the foil so water can drain through into a saucer. Water when the soil is dry. Reference: The University of Illinois Extension Poinsettia Pages. Cedar fence with secret “Hobbit” gate for the kids, Laurelhurst. 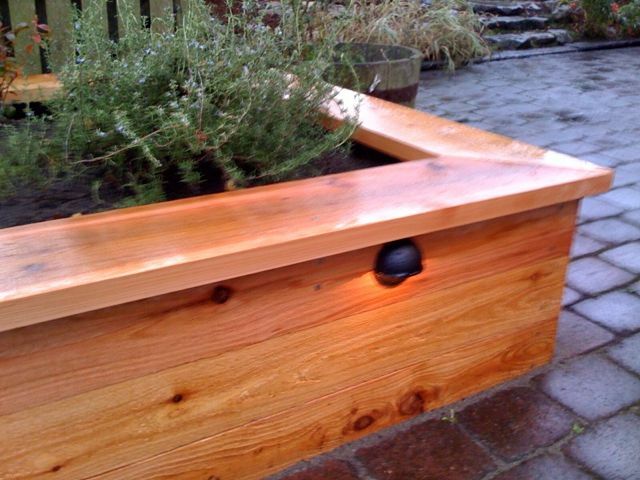 Custom-built by Ecoyards. 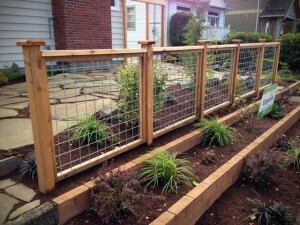 Galvanized steel mesh fence with cedar frame by Ecoyards. 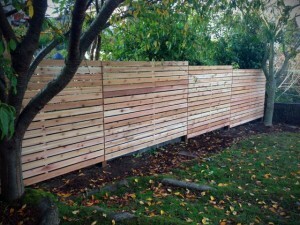 Cedar fence with transparent stain by Ecoyards. Photo by Meryl Schenker. When we first bought our house in West Seattle, you could walk directly from our front yard into the open space of our backyard. We didn’t have a fence that separated the front and back yard spaces, and for a while that worked just fine for us. But then we got a dog and later a kid, and it seemed appropriate to build a fence to prevent both from running into the street. We wanted privacy, but we didn’t want to be completely screened from the street, so we settled on a three-foot lattice fence with landscaping to provided added privacy, and an arbor where a hydrangea vine and tea roses could grow. There are many reasons for building a fence, including to: mark your property line, create privacy in your backyard, add charm and structure to your house, or even add property value by creating more useable space. There are also many types of fence designs (formal, picket, classic), and materials (wood, metal, vinyl, bamboo, wrought iron, etc.). 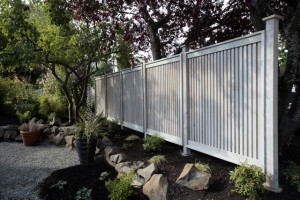 Some clients want full privacy and fences as tall as possible, while others want simply to create a focal point in the yard. What ever your style or needs, Ecoyards can work with you to design the right fence for your home. We’ve custom built a wide range of wooden fences and arbors to suit clients’ individual needs, tastes and budgets. 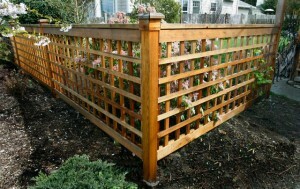 We specialize in custom wooden fences, and other woodwork, such as raised vegetable beds. We’ll work with you to come up with a style. Contact us for a free estimate. 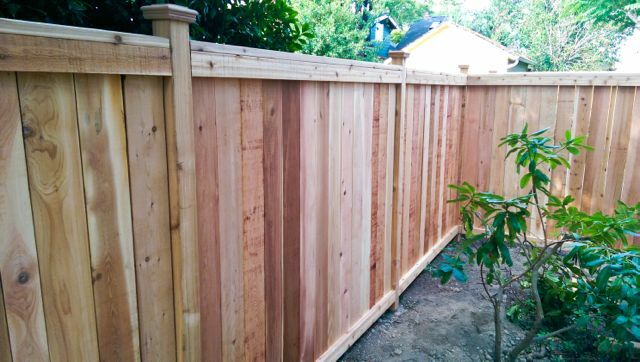 We just finished a more formal-style cedar fence in the Laurelhurst neighborhood. It’s exactly the kind of fence you would have wanted as a kid. Built into the fence is a small Hobbit door (look closely and you’ll see the black door handle) that allows the clients’ children and the kids next door to go between their houses. Not everyone would want this, but the client and his neighbor are friendly and used to having the kids tromp through each other’s yards. 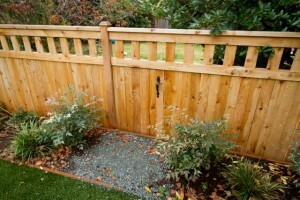 The fence provides privacy for the homeowner, but is still inviting to the next door neighbors. 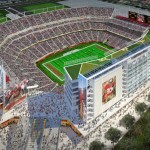 The San Francisco 49ers are getting a new football stadium in Santa Clara, Calif., and there’s one particular landscape feature being built that we think is pretty cool and environmentally-friendly. The massive construction project features a bioretention system, an innovative way to control stormwater runoff that pollutes local waterways. As you can imagine, a venue with seating for about 70,000 or so fans would require lots and lots of parking spaces, sidewalks and other hardscaping. Rain falling on parking spaces, for example, would wash grease, oil leaked from cars and other petrochemicals into storm drains and right into a local creek that eventually flows into the San Francisco Bay. The contractors, however, used a low-impact development technique to slow the flow of runoff, filter that rainwater on site. 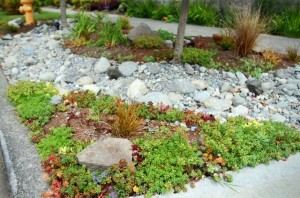 They designed a bioretention system that collects runoff, prevents it from eroding surrounding natural landscapes, and treats the polluted stormwater on site. The stadium site will have six bioretention systems in parking lots and in the area next to the stadium. The bioretention and biofiltration system looks like any other parking lot planting strip. It will likely have flowers or trees, but in the trenches below are a series of pipes, gravel, soil, and other material that filters and then carries treated water out of the system. The stadium project was required to meet tough California rules; the treatment soil in the system had to retain 5 inches of water per hour. If you’re interested in seeing how the installation went, check out this video. Read more about the project here. If you’ve ever wondered what kind of tree or shrub is growing in your backyard, or if you covet your neighbor’s flower but its name stumps you, look no further. The plant detectives at the Otis Douglas Hyde Herbarium at the University of Washington Botanic Gardens are here to help. The Seattle Times recently wrote a feature on the UW graduate student (and her army of volunteers) who staff the center and try to find get to the bottom of flora mysteries. As the Times notes, facility’s bigger mission is to collect and house specimens of all plants grown in the UW Botanic Garden. But in between, the staff helps the public with plant identification at no charge. If you have plant or other specimen and want to know what it is, bring in a sample (including the fruit or flower whenever possible). A photo of the entire plant also helps. You can also drop off plant samples for identification with the Center for Urban Horticulture reception desk when the herbarium is not open. If your plant sample does not have flowers or fruit, the herbarium will still make every effort to identify the plant sample, but says it may not be able to accurately identify the plant species. Contact the herbarium at 206-685-2589. You may also download a plant identification formand mail it in with your plant sample to: Hyde Herbarium, UWBG, University of Washington, Box 354115, Seattle, WA 98195-4115. Ecoyards makeover of West Seattle parking strip. All across Seattle, homeowners have been reclaiming the parking strip — the city-owned no-man’s land between the sidewalk and the street in front of their homes — and remaking it into a more beautiful or useful part of their home landscape. One of our neighbors has been working on a DIY project to transform her grass-covered parking strip into a low-maintenance but edible garden space. Because the city-owned property is public, she wants to install edible plants that would provide bounty to anyone in the neighborhood who wants to help themselves. Other residents are making use of these parking strips to plant vegetables, install raised beds, add extra beautify to their landscapes or creating a landscape that doesn’t require mowing. 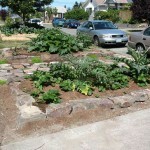 After much uproar from citizens, the city of Seattle relaxed rules on gardening in planting strips back in 2009. Residents no longer have to pay the old $225 permit fee to plant in the space, but you still have to follow certain setback rules and height requirements. The city keeps a master tree list of trees that can be planted in the parking strip. It offers useful information such as mature height, whether it can be planted under wires and what fall color it offers. Do I need a permit? No permit is required if you are gardening in the planting strip in front of your house. A FREE street use permit is required if you plant a tree or install hardscape elements, such as a raised bed or pavers. Where do I get a permit? Apply for a Street Use permit online, or in person on the 23rd floor of the Seattle Municipal Building at 700 5th Ave.
We recently had a chance to check out one of Seattle’s many green roofs, sometimes called eco-roofs or vegetated roofs. The 12th floor jury assembly room at the Seattle Justice Center opens into a terrace where you can view a green roof in action. We got to check it out on a recent overcast day. As you may know, green roofs provide an innovative solution to the problem of stormwater pollution and runoff. 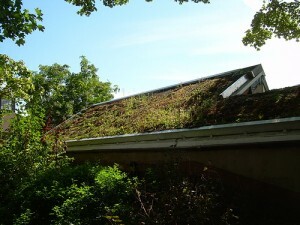 Green roofs may include drought-tolerant plants or they may be extensive lush roof-top gardens. The idea is that the plants will help absorb pollution, slow polluted runoff into streams, while providing some insulation to the building. The Seattle Justice Center was the city’s first municipal green roof. It was built in the summer of 2004 and has about 7,300 square feet of green roof. It’s had some challenges, including being overtaken with weeds and about one-third of the plants during the establishment period had to be replaced. Many of the plants used are low-maintenance, including beach strawberry and Point Reyes creeper. Seattle Tilth Green Roof. Photo by Camera Wences, via Flickr Creative Commons. 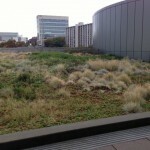 A December 2009 survey in Seattle found there were about 62 green roofs in the city, including extensive and intensive green roofs and large rooftop gardens. The green roofs covered a total of 359,375 square feet. They seem fairly evenly split between small, medium and large sizes. Most of them are found in centrally located neighborhoods with few in the Southeast and industrial areas. The vegetated area is still relatively small, about 8.5 acres of pervious surface out of the city’s total roof surface area of 13,150 acres. This map shows just a smattering of the green roofs in Seattle, from the Seattle Cancer Care Alliance to Seattle City Hall to the Harborview Medical Center garage. The city has been pushing to get more green roofs built, allowing developers to get some credit for the stormwater benefits that come with green roofs. National Geographic published a beautiful photo gallery of green roofs from around the word. Gardens in the Northwest can put on spectacular displays of colors during the autumn. From native vine maples and Japanese maples to burning bushes and asters, gardeners have plenty of options for incorporating bursts of color into their landscapes as summer winds down into fall. This can be done through fall-blooming perennials, showy annuals or employing the colorful foliage of shrubs and trees. 1. Vine maple. This is a classic Northwest native with show-stopping orange, yellow and red color that last well into winter. 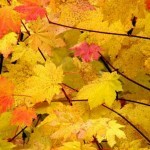 Coax the best fall color by planting these trees in a spot with at least a half day of sun. 2. Asters come in a variety of colors, ranging from pink to blue to white. They have daisy-like flowers that bloom from late August into early winter. Aster ‘monch’ is a particularly long-lasting bloom with clear lavender-blue flower. 3. Sedum ‘Autumn Joy’ offers year-round interest, not just the pinkish-red blooms that pop in the fall. They’re drought-tolerant and require little maintenance, and are a must in any Northwest garden. Japanese maple. Photo by Ecoyards. 4. Japanese maples. There’s no shortage of Japanese maple varieties to choose from, depending on the color you’re going after. Japanese maples are show-stoppers this time of year. Yellow, orange, green and varying shades of red, burgundy and purple. 5. Burning bush, or ‘euonymous alatus,’ is a large-foliage shrub with brilliant flaming red color during the fall. 6. Goldenrod, Solidago rugosa ‘Fireworks,’ are easy-to-grow, hardy perennials. ‘Fireworks’ have tiny flowers that are clustered into spires of yellow. Butterflies and bees love these flowers.